I apologize for the lack of posts. I have been fighting with blogger to try to change my template around and well, blogger is winning. Hopefully, I will get it to where I want soon! If anyone knows a lot about html and template editing I would love some help!! Jindie Nail Guns & Roses is a blueish gunmetal shimmery polish with several shapes and sizes of metallic pinks and berry colored glitters. All fingers are 3 coats of Guns & Roses with a base coat of Seche Clear and a top coat of Seche Vite. As always with Jindie Nails polish, the formula of this was perfect. While the larger hex glitters give the appearance they are curling, it is simply just reflective curling. 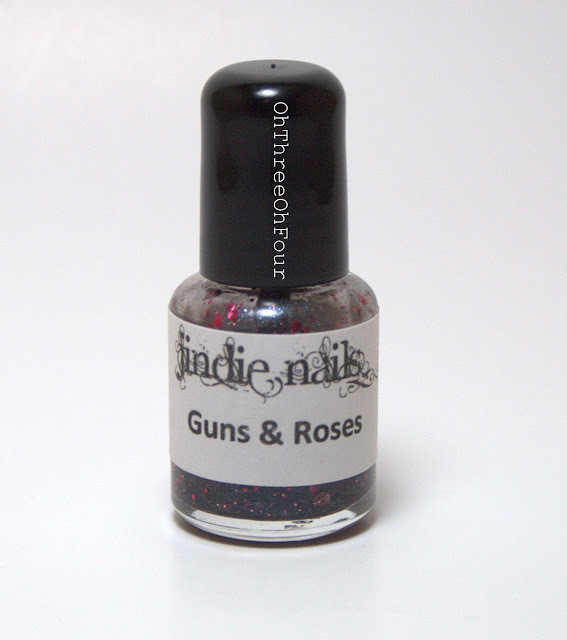 Jindie Nails Etsy shop is located here, she currently has a ton of colors (including Guns & Roses) in stock! Make sure to like Jindie Nails on Facebook here and follow her on Instagram here.